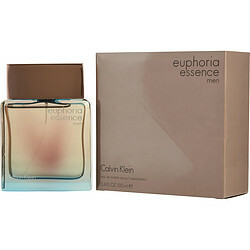 Celebrate your masculinity with Euphoria Essence Men, a robust men's fragrance introduced by Calvin Klein in 2015. Bergamot and ivy top notes create a fresh, clean aroma, while pepper and suede heart notes add spice and richness to the scent. Guaiac wood in the base gives the fragrance a woodsy finishing touch that invigorates the senses. From your big presentation in the boardroom to a first-date coffee, this bold fragrance is the perfect addition to your ensemble whenever you hope to leave a lasting impression.